G.S.FLEXIBLES manufactures very Hydraulic Hose Fittings. It has excellent crush resistance and offers excellent protection against axial elongation. In all the types, invariably heavy gauge of strip is used making it ideal for industrial and other demanding applications. We manufacture High Precision Nuts for Hydraulic Hose Fittings on CNC Turning Centers. We manufacture NUT for OEMS and bulk Export Order. 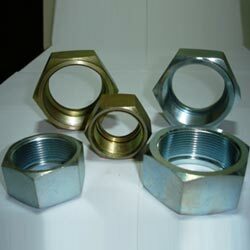 Nuts are manufactured as per requirements of ISO 8434 & ISO 12151.